If you are seeking a source of portable power, a generator is the ideal option. Generators are a great power source for all your outdoor adventures and jobs that require electricity. They are also a good backup power source in case of a power failure. With so many sizes and models on the market today, it can be difficult to determine which generator is right for you. Generators manufactured by the Kipor company should be considered in your search for the right model. The Kipor brand is not as well known as some others, such as Yamaha and Honda. However, their products are growing in popularity because of many advantages that they offer. Firstly, the alternators on Kipor generators are attached directly to the engine, eliminating the need for a flywheel. This means that they are smaller and much lighter than most other types of generators. Additionally, they make use of digital technology that allows them to regulate the power output depending on the need; this leads to twenty to forty percent less fuel consumption. Another advantage to Kipors is their noise regulating components, which ensures that they will be four to eight times quieter than more traditional generators. Each generator from Kipor is protected by a one or two year warranty, so there is no risk in trying one out. 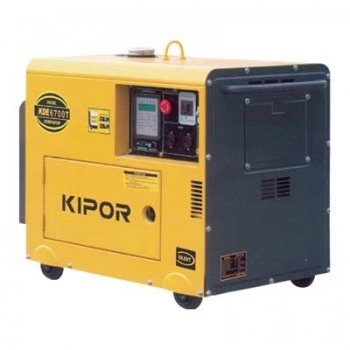 Perhaps the greatest advantage of purchasing a Kipor generator is the price. Kipors are literally hundreds of dollars less than comparable models from competitors. They can be purchased from a variety of hardware stores, department stores, and online retailers for relatively low prices. If you are on a tight budget, a Kipor is a very attractive option. Choosing a generator can be a difficult decision. It is important to find a model that will suit your needs and your budget. If you are seeking a generator that is quiet, lightweight, and affordable, a Kipor may be a wise choice.